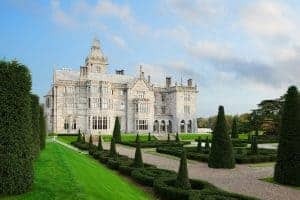 Five-star Adare Manor has reopened after almost two years, having undergone an extensive redevelopment. It has added a 42 new bedroom wing bringing the total number of bedrooms to 104. The new development comprises a new ballroom with a capacity for 350 guests and will cater for weddings, events and conferences. The original building has been fully developed inside with a new Crème de la Mar spa, pool, relaxation area, boardroom and cinema. The Robert Trent Jones Jnr golf course has been completely redesigned and remodelled and is expected to open to the public in March 2018.